If you love cherry chocolate cordials, you'll love Starbucks' Cherry Mocha. But if you don't, well, try something else. For many, Valentine's Day is the most dreaded holiday of the year — whether they're in a relationship or not. The pressure of finding the perfect gift, or just facing soul-crushing loneliness, can be too much to bear. But not to worry, coffee lovers. Starbucks is here to take the edge off with a super-sweet holiday drink based on a popular chocolate. On Thursday, Feb. 7, Starbucks stores in the U.S. and Canada will be bringing back the brand's limited-edition Cherry Mocha, which made its debut on this day last year. 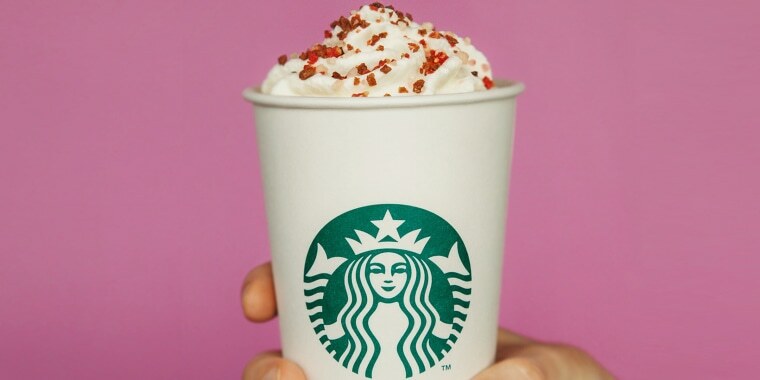 To make the drink, baristas start with hot espresso poured over "a slightly sweet mocha sauce and candied cherry syrup," which is then mixed with steamed milk and topped off with whipped cream, sugar and a touch of cocoa sprinkles. The drink is available hot, iced or in blended form as a Frappuccino. Last year, the beverage caused a minor stir among chocolate lovers. Some foodies were really into the idea of a drink that closely resembles a cherry cordial that one usually finds in a traditional Valentine's Day box of chocolates — but not everyone is on board. Starbucks seems intent on winning my affections this year. Cherry Mocha? Yes. I approve. TODAY staffers tried the hot version of the Cherry Mocha, as well as the blended Frappuccino, in 2018. Like many of Starbucks' holiday drinks, both beverages were really, really sweet and had tasters divided. "It is literally just a Java Chip [Frappuccino] except they replaced the chocolate chips with that cherry flavor," a TODAY staff member said after trying the icy drink. "It tastes like a Shirley Temple. It tastes like a bad Shirley Temple," another taster said. "I love the mocha part, but the cherry flavor is really cough syrup-y," another staffer added. So, depending on your taste buds, this drink could either make you fall in love — or prompt you to dump that coffee obsession immediately. Starbucks limited-edition Cherry Mocha will only be available for the next seven days, through Feb. 14, which is plenty of time to load up on your newest caffeine fix as you plan out your Valentine's Day. This post was originally published on Feb. 7, 2018.